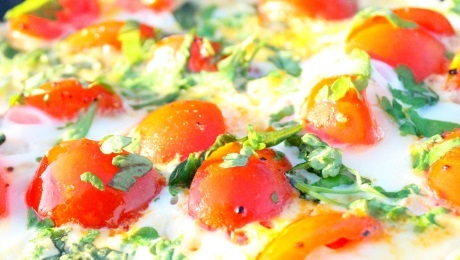 Halve or quarter the cherry tomatoes, pour some olive oil into a non-stick grill proof pan and tip the cut tomatoes in. Season them well and fry them off for 1-2 minutes until just soft. In the meantime put a grill onto high heat and lightly beat the eggs in a bowl. Scatter the chopped herbs over the tomatoes and pour the beaten eggs over. Quickly stir the eggs with a silicon spatula to even them out and make sure they cook evenly. Take off the heat as they start to set, grate a little cheese over the top (if using) and place under the grill for about 2-3 minutes. Slide onto a warm plate and serve immediately.